It rained a bit last night, judging by how wet everything still was when I woke up, but it wasn’t loud or windy, so I slept well enough. 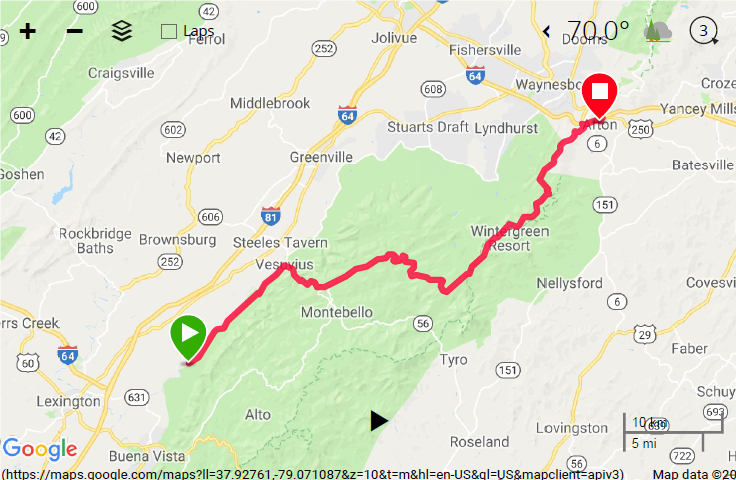 The day was going to be short in terms of mileage, but I wanted the opportunity to rest after the climb to the Blue Ridge Parkway, so I didn’t dawdle over getting onto the road. The day began with a slow climb approaching the town of Vesuvius. During this part of the day, I found out why the Mallard Duck Campground wasn’t showing up on my GPS: the location was off by nearly 8 miles. 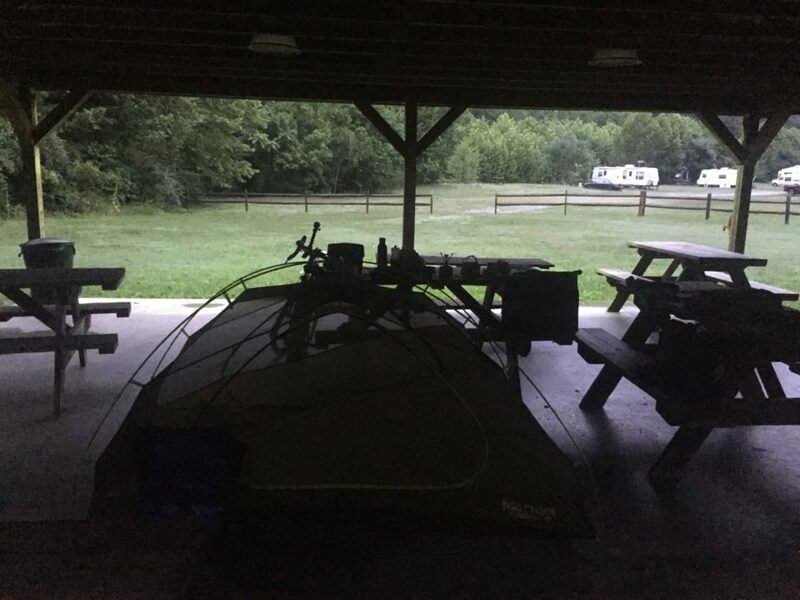 If I had been westbound, tired, and counting on that campground being where it showed on my screen, I would not have been happy. As it was, I made a note of the discrepancy and kept going. Vesuvius was listed on the map as having a convenience store, but I didn’t see it. That doesn’t mean it isn’t there, just that it wasn’t on the streets I was on. Since there were two more towns listed as having convenience stores on my route today, I didn’t worry about it too much. After a break for a snack in a church parking lot, I started the climb. It was difficult, people did not exaggerate. I think the Ozarks had steeper inclines, but none quite so long. There was a steep uphill on one side and a steep down on the other for most of the way, meaning there wasn’t much of a shoulder most of the time. 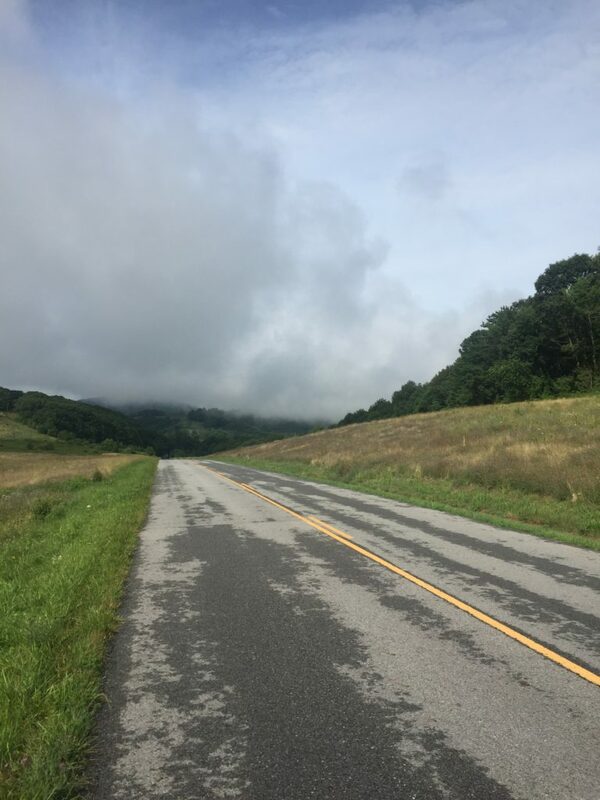 There were, however, a number of driveways off the road that were convenient locations to stop and take a break, which I did several times over the course of the 3 miles of the climb to the Blue Ridge Parkway. 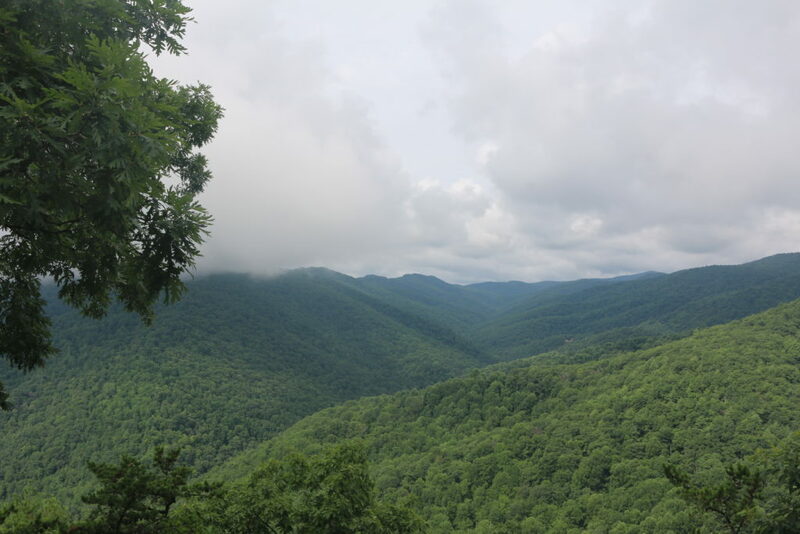 I’ve heard of the beauty of the Blue Ridge Parkway, and it was fun to see it firsthand. The clouds blocked a lot of the views, but there were enough to inspire a pause for a good look. Until the rain began, that is. The rain came while I was climbing a bit, I outran it on a downhill, it caught back up to me again on the next climb, I got out in front once more speeding down. Then I pulled into the Humpback Rocks Visitor Center and it caught up again for the last time while I was talking to the woman behind the counter. 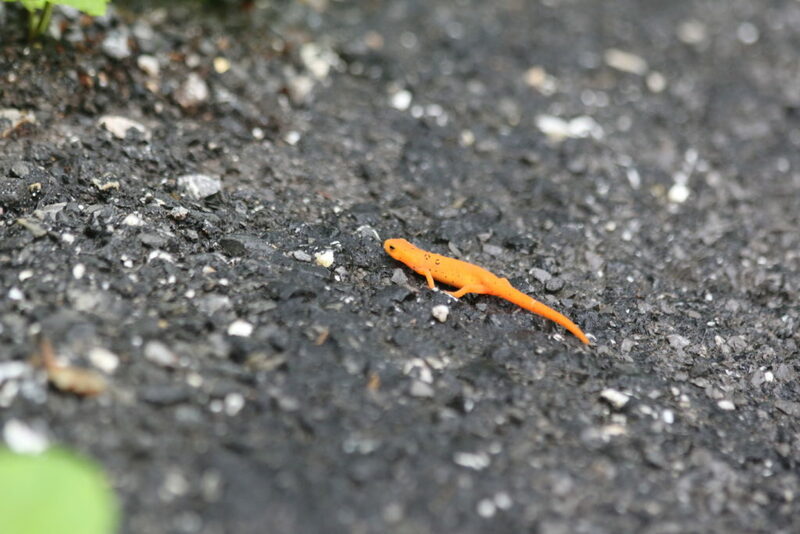 We chatted for a while. She’s met other riders, but by an odd chance they’ve all been westbound. She’s also heard of the Cookie Lady though she didn’t know where the house was. After a snack, I decided to press on the last few miles rather than wait for the rain to stop completely. The rest of the ride was almost all downhill, which was pleasant. What was not so pleasant was being unable to find the convenience store in Rockfish Gap. The one up on the Blue Ridge Parkway had been off the road, so I had skipped it counting on the one right before Afton. I have food, so I’m not going hungry tonight, but I had been hoping for the opportunity to buy something to cook in the kitchen I have access to this evening. The Cookie Lady was, is!, a TransAm legend. The downstairs apartment has housed thousands of cyclists since the TransAm began, and is stuffed with memorabilia. (And, by the smell of things, mildew and/or mold.) There was some food in the fridge, some of which is good and some of which needed to be thrown out (mold again, or open bottles of drinks that someone left behind). After a quick tour of the place, I emptied out the bucket on the dehumidifier, cleaned out the fridge a bit, and made myself a snack. I feel a bit like I’m in a museum, which makes it a little bit difficult to relax completely. I’m glad to have stopped here, though. 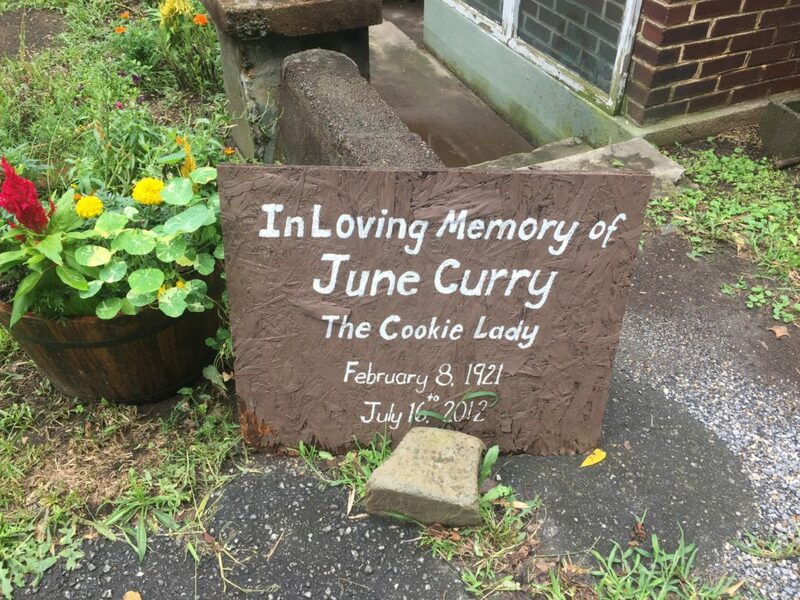 It’s nice to see this memorial to the great kindness June (the cookie lady) spread during her life. It’s also nice to see it continued. The sign marking The Cookie Lady’s house. Shirts, cards, newspaper clippings, you name it. 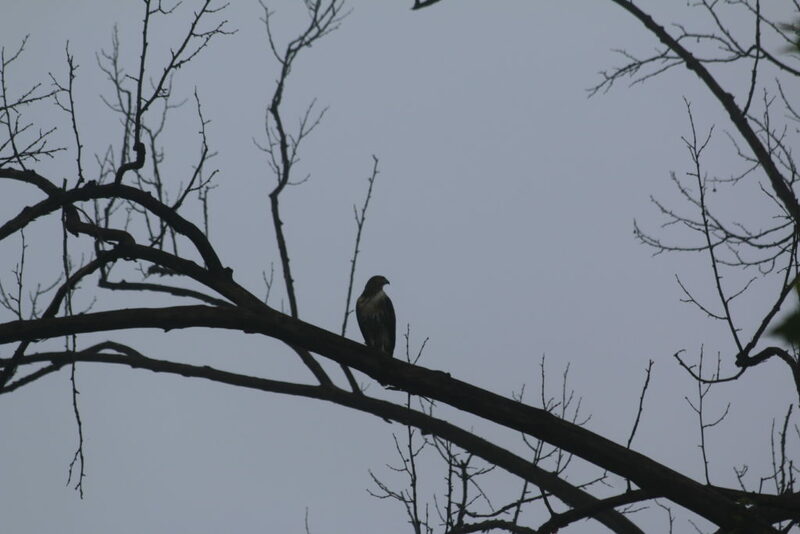 Because today was such a short day, I also took the opportunity to update my blog. I’ve fallen far behind, and I want to catch up before I finish. That memorial to the cookie lady is sweet, she must have truly loved cycling and shared that love. Wonderful! You’re part of the Cookie Lady’s legacy now. And you cleaned out her fridge, which I’m sure she’d thank you for. You did it! Didn’t doubt it for a minute! Yay! You made it. Not much further to go!